This Intel Celeron J3455-powered NAS for home users comes in two variants (4 GB and 8 GB RAM), offering support for up to four 3.5-inch/2.5-inch drives and featuring two Gigabit RJ45 LAN ports, AES-NI hardware encryption, 4K output/transcoding, and more. Yesterday, QNAP Systems unveiled a new NAS for home users and small businesses with modest storage requirements. According to the official press release, the TS-453Bmini vertical NAS "couples elegant glossy aesthetics with high performance, security and intelligent services to provide excellent data storage, backup, sharing, and entertainment options." TS-453Bmini is powered by a 64-bit Intel Celeron J3455 processor, coming with two memory setups: TS-453Bmini-4G (2X2 GB DDR3L dual-channel RAM) and TS-453Bmini-8G (2X4 GB DDR3L dual-channel RAM). Both variants offer four hot-swappable bays with support for both 3.5-inch and 2.5-inch HDDs or SSDs, AES-NI hardware-accelerated encryption, 4XUSB 3.0, 1XUSB 2.0, 2XGigabit RJ45 LAN ports, remote control, as well as HDMI 4K [email protected] Hz output and transcoding. 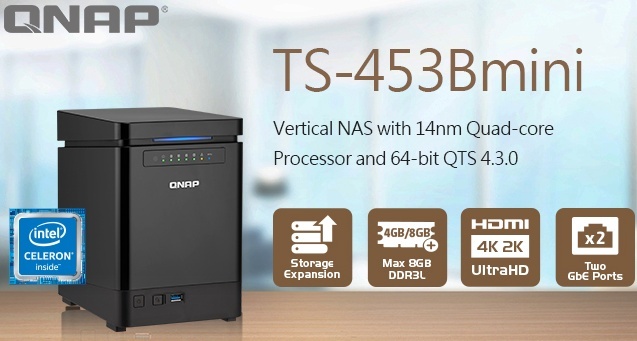 As all similar QNAP products, the new TS-453Bmini supports VMware, Citrix, cross-platform file sharing, flexible backup solutions for Windows/Mac, and more. The two hardware setups mentioned earlier also can be expanded by using an 8-bay UX-800P expansion unit, increasing the maximum amount of storage available to 120 TB (using 10 TB drives). QNAP TS-453Bmini is available and can be acquired from one of the many QNAP resellers presents in most markets. The price depends on retailer and location. Taipei, Taiwan, March 7, 2017 - QNAP® Systems, Inc. today released the new TS-453Bmini vertical NAS. Powered by the latest Intel® 14nm J3455 quad-core 1.5GHz processor (burst to 2.3GHz) and featuring AES-NI encryption, 4K UHD output and transcoding, the TS-453Bmini couples elegant glossy aesthetics with high performance, security and intelligent services to provide excellent data storage, backup, sharing, and entertainment options for home and small office use. With 4GB/8GB DDR3L dual-channel RAM (upgradable to 8GB), dual Gigabit LAN ports and SATA 6Gb/s, the TS-453Bmini drives up to 225 MB/s read speeds and runs tasks smoothly and quickly under dual network environments. The TS-453Bmini features Intel® AES-NI 256-bit hardware-accelerated encryption for both shared folders and the full NAS volume to provide transfer speeds of up to 225 MB/s and ensure data security without compromising performance. The total potential storage of the TS-453Bmini can be expanded up to 120 TB by using an 8-bay UX-800P expansion unit (when using 10 TB HDDs). QNAP's exclusive vertical NAS series has received excellent feedback for its excellent performance, elegant appearance, and compact design. With user-friendly features, quiet cooling, adjustable LEDs, and a tool-less design for installing and upgrading hard drives and RAM, it is ideal for smaller usage environments and for use with users without specialized IT knowledge. Running on the latest 64-bit QTS 4.3 NAS operating system, the TS-453Bmini offers numerous new and improved applications to increase the efficiency of management tasks and everyday use. Container Station supports various container applications and provides support for QIoT Containers and IoT applications. Virtualization Station allows users to run multiple Windows®, Linux, UNIX®, and Android™-based virtual machines. QmailAgent centralizes multiple email accounts and simplifies daily email management. Qcontactz centrally stores and manages contact information. The TS-453Bmini also uses advanced virtualization technologies to perfectly integrate QTS and Linux. By installing Linux Station and connecting a keyboard, mouse and HDMI display to the TS-453Bmini, it can be used as if it was an Ubuntu® PC. This is especially useful for IoT developers. The TS-453Bmini also supports 4K UHD output and real-time transcoding to provide a smooth and high-quality multimedia experience across devices or where network bandwidth is limited. "With a 64-bit quad-core processor and the next-generation 64-bit QTS 4.3 NAS operating system, the TS-453Bmini provides performance hardware and key software features within a compact and user-friendly chassis," said Jason Hsu, QNAP Product Manager. "By supporting the open-source Ubuntu® platform, it also adds greater value in allowing users to develop various IoT applications and to build a secure private cloud system for IoT storage." Additional features include support for VMware®, Citrix®, Microsoft® and Citrix® to assist in flexibly deploying and managing virtualization environments; cross-platform file sharing for Windows® and Mac® and desktop/laptop backup; Windows AD, LDAP directory services and Windows ACL to improve the efficiency of permission settings. The TS-453Bmini also offers flexible backup solutions for Windows and Mac and disaster recovery solutions with RTRR, rsync and cloud storage backup. The new TS-453Bmini is now available. For more information, and to view the full QNAP NAS lineup, please visit www.qnap.com.